Some places are meant to be left. Some places look better in the rain. that I only drive in storms. But some places are meant for love. A cup full of oil. Interview with Aaron Weiss of mewithoutYou. Blue Indian's interview with Aaron Weiss of mewithoutYou from Drew Goddard on Vimeo. I confess. I don't know how to make the most of this life. I want so much from this life. At least 5 lifetimes worth, if not more. So how do I deal with the fact that I only have one life? How do any of this deal with that? I'll spend this life, figuring out a fraction of what I want from this life. So this post is actually going to combine my last two posts. First off, I just got in my Sumatra Mandheling beans to Roast. I'm really excited about these beans, and roasted up three batches this afternoon (Last time I smelled up the whole church, but I've figured out a good method involving doing it out my bedroom window and using a fan). 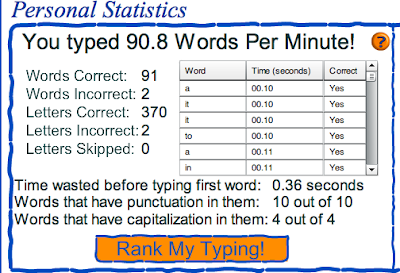 And WHILE the beans were roasting (They take about 7 minutes) I returned to the typing to test to make good on my claim that I could reach 90 WPM. 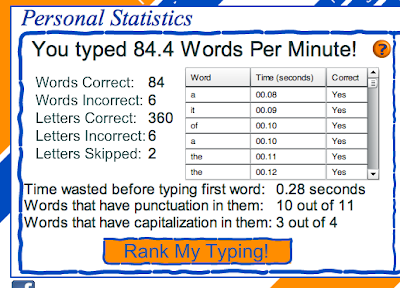 My first try today landed me at a new record of 86.7. 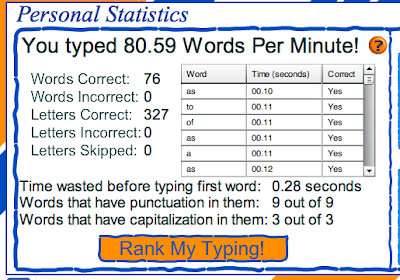 Then a few tries later I pulled off a heartbreaking 89.2. Then, during my third batch, this happened . 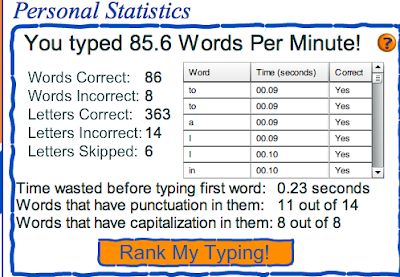 . .
After Lukes last comment (He apparently didn't even try the test or else he would see that it takes many considerations into calculating your score) he'll be happy to know that I only missed two words. 1. I feel really lame for needing to show this off on my blog. 3. I saw this guy . . . I hate these kind of things, because I usually become addicted. Luckily I have restrained myself and haven't played this game that much. 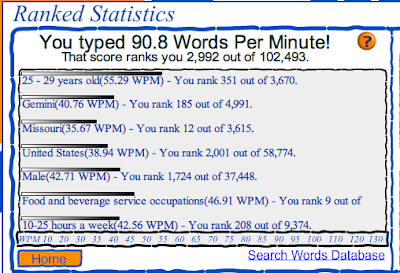 I was mainly averaging 70 - 74 WPM, but then something clicked and I reached a whole new level . . .
Thats right, coffee roasting. I am now a home roaster. I ordered my green coffee beans (Costa Rica Las Lajas Mell and Colombia Sierra Nevada) and picked up my $9.99 Walgreens Hot Air Popcorn Popper and roasted 6 batches of coffee today! Its the experiment stage. I roasted 3 batches of each kind of bean for varying lengths of time. Now, the hard part is waiting a couple of days for the CO2 to escape before grinding and pressing the beans. 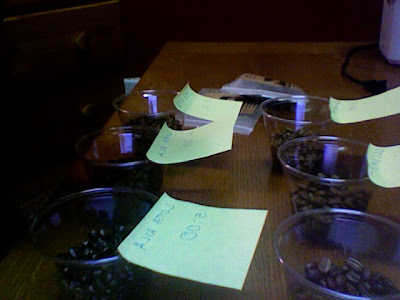 I've been doing a lot of researching into roasting coffee beans and it has been fascinating. I truly hope that this is the beginning of a long time hobby.